We do requests here at The Midnight Tracker, and we finally are getting around to this one. Our old pal, The Hose, has for no apparent reason been wanting to hear again the soundtrack from “Where the Buffalo Roam.” That’s the 1980 film starring Bill Murray as gonzo journalist Hunter S. Thompson. The soundtrack is noteworthy primarily for Neil Young’s involvement. He contributed seven cuts to the soundtrack, all riffs and variations on “Home on the Range.” Young and David Blumberg also did the orchestral arrangements. Whether that’s a good thing, you be the judge. Aside from Young, the soundtrack consists of what even then were classic rock tunes from Jimi Hendrix, the Temptations, Bob Dylan, the Four Tops and Creedence Clearwater Revival. As you listen to Side 1, that’s Murray and fellow actor Rene Auberjonois, in character, singing “Lucy in the Sky With Diamonds.” Really. 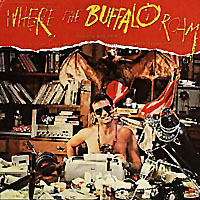 “Buffalo Stomp,” “Ode to Wild Bill #1,” “All Along the Watchtower,” “Lucy in the Sky With Diamonds,” “Ode to Wild Bill #2,” “Papa Was a Rolling Stone” and “Home, Home on the Range,” various artists, from “Where The Buffalo Roam” soundtrack, 1980. It runs 19:02. This entry was posted on May 26, 2008 at 10:39 pm and is filed under May 2008. You can subscribe via RSS 2.0 feed to this post's comments. odd that MCA left out the Pointer Sisters’ “How Long (Betcha Got a Chick on the Side)” from the “Where the Buffalo Roam” soundtrack, (the song appeared in a party scene) seeing that the Pointers were on MCA (via Blue Thumb) at the time. hey – any chance you’d repost this soundtrack? I heard a bit of LSD with bill murray and am hooked. Thanks!